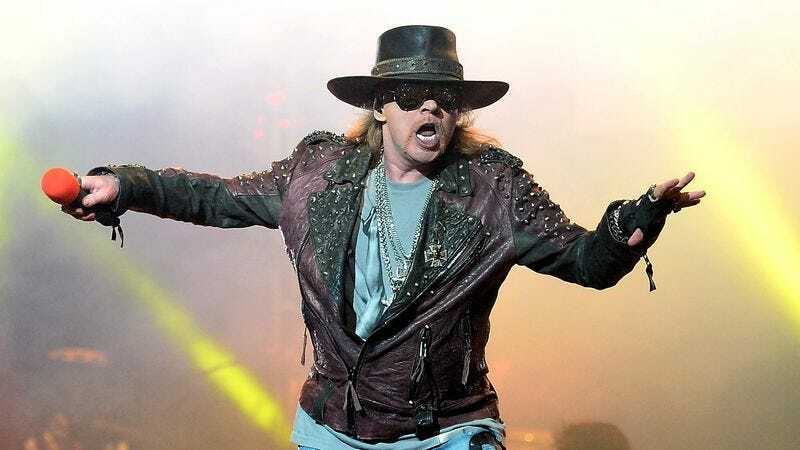 Get your Chinese Democracy jokes ready, because here’s some news about how Axl Rose is sometimes late for things. Alternative Nation (via Consequence Of Sound) recently shared a Tampa DJ’s anecdote about a time when the former Guns N’ Roses frontman was late for a concert because he was watching a Teenage Mutant Ninja Turtles movie. It seems Rose and the band had a show in Tampa one December day in 1991, but the singer couldn’t hear the calls for sound check or the thousands of screaming fans because he was too engrossed in Teenage Mutant Ninja Turtles II: The Secret Of The Ooze. The DJ, a former employee of the venue where Rose was presumably yelling at ninjas to go on with their bad selves, recalls the owner being really angry at the singer for living up to his reputation for lack of punctuality. When Rose’s handlers were pressed for an explanation, they reportedly said “100% of his attention” was on the (disappointing) sequel, and he simply could not be bothered. No riots ensued, but Rose was shellshocked nonetheless.